One night only! 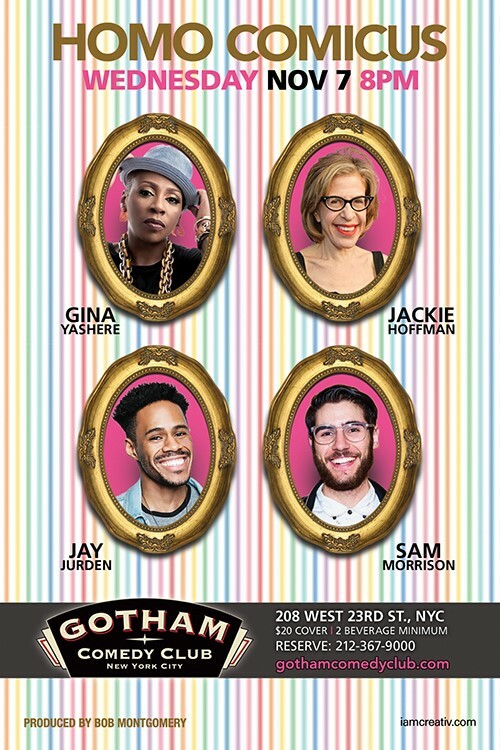 Modern masters of hilarity from the wondrous world of LGBT and LGBT-adjacent stand-up comedy, including brilliant Brit wit GINA YASHERE (from "The Daily Show" on Comedy Central, NBC's "The Tonight Show" and "Crashing" on HBO), JACKIE HOFFMAN (from Broadway, film, Emmy-nominated for F/X's "The Feud" and her own hit solo shows), JAY JURDEN (from The New Yorker, Vulture and a Stand-Up NBC semifinalist) and SAM MORRSION (from SiriusXM Radio, Laffin' Matterz TV, the Travel Channel and his fabulous one-man show "Hello, Daddy!"). Hosted by Out Professionals www.outprofessionals.org.